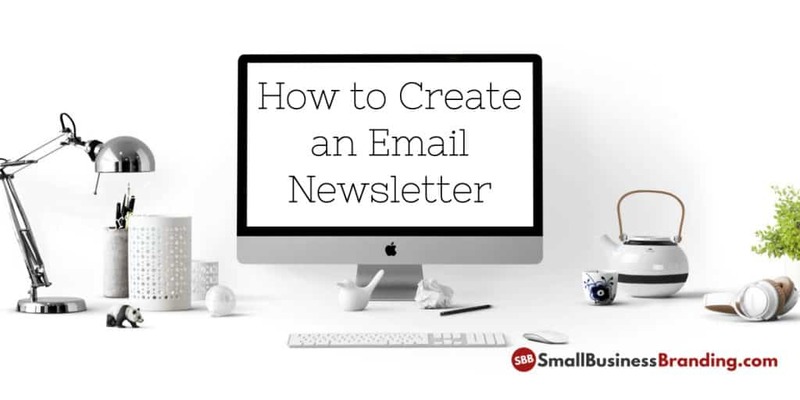 Chances are, you are here to make an email newsletter that is either attached to your blog or a standalone. You probably also hope to make some money out of this gig. Since that is the case, the one thing you need to get out of your head right now is the word FREE. If you want to market your blog, show, book, products, __fill-in-the-blanks__ with email, it’s a pay to play thing. Why? Because you do not want to manage email deliverability and reputation by yourself. It’s far too technical for most people. Even if you are rather geeky, it’s going to take way too much time away from you when you should be spending that time marketing and growing your company. 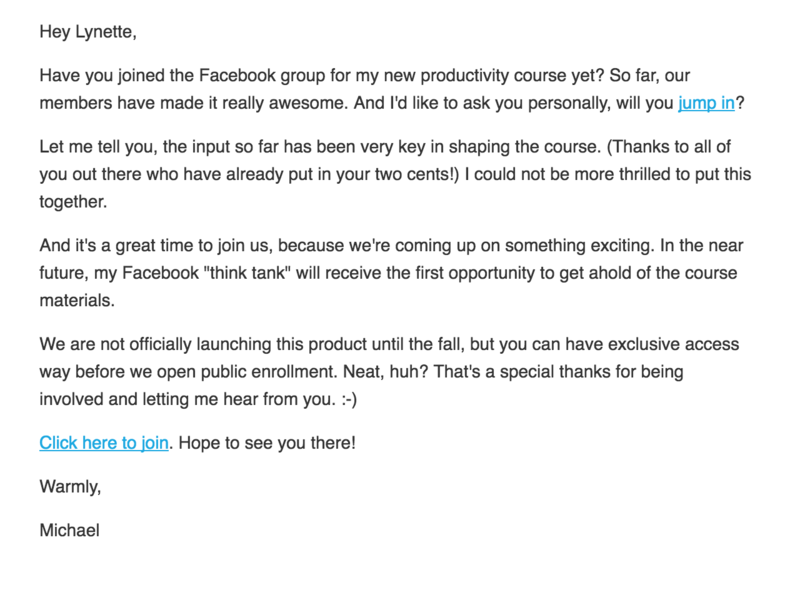 Once you get past that, learning how to make an email newsletter is pretty simple. It is easy to spend a ton of time going back and forth, examining the pros and cons of each service. My advise is don’t. Pick one that fits your budget that you feel you can get comfortable with and run with it. If you still have no idea, use Sender like I do. Start with the smallest plan. You can always scale up later. The from name – this is what people will see as the sender in their inbox. Use your own name here. Especially if you are the face of your website. Names are more personal and people expect emails from a person. If you must include your site or company name, do something like Lynette from TechBasedMarketing. The from email address. This is what people see when they view the email address of the sender and also the address that replies will generally be sent to unless you specify a different from address. So make sure it’s one you or someone checks on everyday. For best results, make this coming from the same domain as your website. Reply address. This is optional. Skip it. Reminder text. 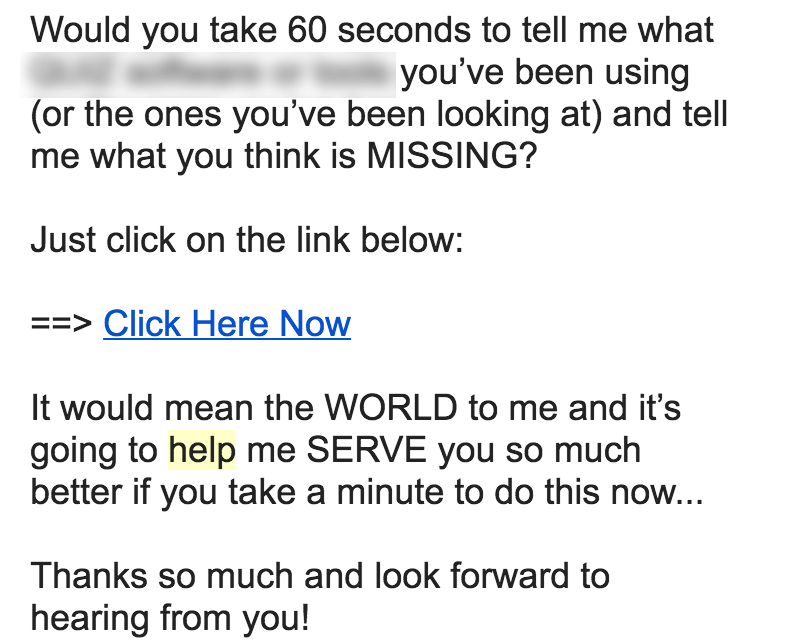 Some services require you enter a short text to remind people why they are receiving this email. Keep it short and sweet here, or use the default for now. You can always change it later. Note. Not all services require all that information up front. Some will have less or more. But this is pretty common. I suggest you write down this information before hand so your list creation process will go as quickly as possible. Once you have a list created, you need to put up a form on your website so people can join it. There are several ways to build this form. The easiest and fastest is to use the form builder that is inside your email service account. Again, try not to overthink this. Pick one, move on. Once you have built the form, you’ll be given some code. You’ll need to paste this onto your website. If you’re using WordPress, simply paste it into a text widget and use that widget in your sidebar or wherever you want it to go. While this is the fastest way, it’s not the most flexible method. The best method is to invest in an email newsletter plugin, or a page builder with newsletter form capabilities. My recommendation is Beaver Builder. Using one of these plugins, you can create beautiful forms that work on various parts of your website without being at all technical. The form creation process is also greatly simplified and that’s always good because frustration kills progress fast. Now that you have your form on your site, what next? You promote, promote, promote. Tell the people you know who might be interested in what you have to offer. Reach out to people online. They may say no but they may also say yes. Put it on your social media profiles. Write guest posts and direct people to your sign up page. The last bit- don’t forget to email people who signed up! Sounds like a no brainer right? But too many people get caught up with the mechanics of how to make an email newsletter. How to grow their list and more and… forget or get scared of emailing the very people they do this for. Put it on your calendar. Make an appointment to email once or more a week. Mix it up between promotional emails, information and a bit more personal emails. Soon, people will be looking forward to seeing you in their inbox. Yeah, but how do you solve the problem of finding time to share all this content? Let’s tackle this one first. This all boils down to my complete belief in the Slight Edge or the Compound Effect. The premise is simple. You’ve heard of it before. People tell you massive action = big results. While I do not disagree, I think the problem comes when we think massive action = massive leaps. Not at all. Most times, success and big results come in the massive number of small leaps and sometimes steps vs leaps. Now that I have laid that foundation. What does this look like? Very simply, 15-20 minutes of scanning your subscribed feeds each day. Find something you want to keep? Don’t save it. Send it to Buffer. That’s it. What if I don’t have another 15-20 minutes? Lunch time – though I do it only when I am alone. Not when eating with others. I think you get the idea. Did you notice something recurring in that list? Yes. The keyword is waiting. 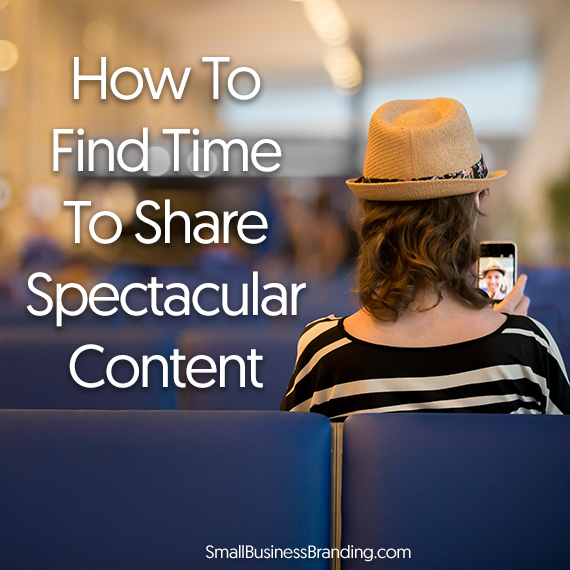 Every time you find myself waiting for something or someone, that’s the perfect time to pull out the phone – no, not to check Facebook – to find content to share silly! Now on the 2nd method. What do I mean by this? As mentioned in my last post. No matter what your business is, there are certain types of content that attract you naturally. Let’s say you are a productivity coach. Maybe you spot a gorgeous planner while you are out in town. Perfect opportunity to snap a photo and… you got it. Load it to Buffer! Then, while on Facebook, you notice a post about how to keep your energy up during the day. You read it, like it and you… yup. Add it to Buffer. Facebook is super smart at showing you stuff they think you might be interested in. Might as well use it instead of feeling used. The tools you need here are simply Feedly and Buffer. That’s it. You can get more fancy if you want but I found fancy often complicates matters. And when you complicate stuff, you are less likely to do it. This works for me, and I hope for you too. Let me know what you think. So you took the experts’ advice. You created lead magnets, set up opt-in pages to collect leads. You work hard to keep your emails out of the spam box, promotional tabs, and what have you. Click throughs are dismal. Nobody responds when you try to engage them. Where did you go wrong? We’ve got you covered. Here are 29 simple steps you can start doing immediately to cultivate a more responsive list by creating a deeper relationship with your subscribers. You’ll find studies like this and reports, that say subject lines between 28 to 39 characters received the highest click throughs. True or not, the thing you need to remember is this. __% of emails are opened on the phone. 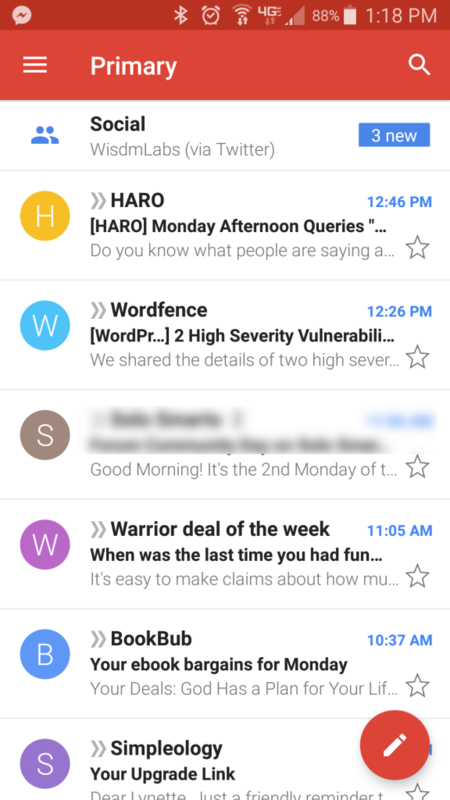 Here’s a screenshot of a Gmail inbox on an Android phone. See how the subject lines are truncated on some? Try to keep it short enough it won’t be cut off. Sometimes, having it cut off can be helpful especially when it ends with some form of curiosity or an ellipsis (or …). But you’d want to reign in the use of that technique because people have tired of them thanks to its wide use on social media. Test and rewrite your subject lines for every email. Remember. The subject line’s job. So focus on words that get people to open. Not to tell the whole story. Note, in addition to the deadline, they’ve also built in some social proof by telling subscribers this is a very popular offer at 4.5 stars. Instead of a time limit, a limited quantity or number of seats can also be very effective. But you want to do this properly. If you’re offering a digital product, make sure it make sense why there is a limit. Telling people you’re running out of copies of your eBook is plain not possible and people will see through that. I would also limit your urgent emails and time sensitive information. If every single email you send out is urgent, you will tire out your subscribers. Nothing is more annoying than opening up an email to find the content does not match the subject line. When you trick people into opening your email, your credibility plummets. It’s OK to build in some curiosity but most times, stating exactly what’s in the email up front is the best. Study magazine and newspaper headlines. They often have limited space and need to “get to the point”. Hot topics relevant to your subscribers make excellent subject lines. You don’t have to make the email about the topic but look for ways to connect what everyone is talking about to what you want to put in front of your audience. Benefits are one of copywriting’s most important rules. It applies to emails too. Inform people what’s in it right from the get go so he will be eager to read the rest. This subject line tells me I’ll have a remedy for my ailing orchids with a household item I probably already have and can implement fast. Controversy always perks people’s ears up, even when they do not agree with you. Only, be sure to back up your claims in your email content. Watch your metrics. Do not assume what worked for someone else will work for you, but don’t not try it either. Give it a shot. Watch your numbers after the fact. Did it work? Too little data? Try it again later. Now, what are the results? Ditch it if your other subject line approaches work better. Keep it, and tweak it if it works. Why tweak? Because people can tire of the same subject lines over and over from you. Download this entire process to work on later. Your email list is much more than a tool to send offers. It’s a way for you to develop a bond, gain your prospect’s trust which will eventually lead to them giving you their business multiple times over. And, sometimes, it could lead to other mutually beneficial things like working together or having them refer others to you. Get their suggestions for what they want to see in your future mailings. 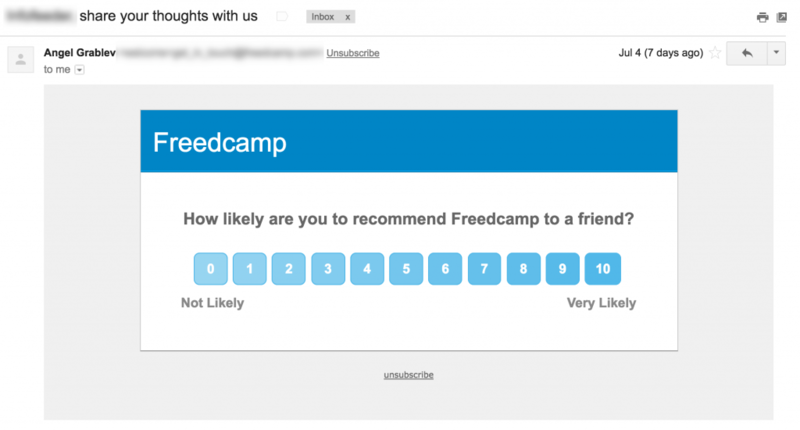 Ask their feedback how you can make your emails more useful for them. When you get responses, it helps you develop a deeper understanding of your target market. Sometimes, they will help you see avenues that you never thought of before. Also, with today’s email technology, you could segment responders from non-responders, further customizing the content so they reach precisely the right group. And when people receive what they asked for, they will naturally be more responsive to your emails. Here’s an example from my inbox. For the longest time, one of the things I always had on my site is “Ask Lynette” page. It has one question, what is their biggest question about ___topic____ and one big text field to submit the answer. This has allowed me to create a lot of focused, well-received content. Not just for future emails, but blog posts as well. Social media allows you to engage with your audience in a way never before possible. Promote your social accounts in your emails. Intentionally invite them to connect with you there or join your group. This does two things. Build your following on social media and encourages clicking and responding to your requests. An email is a poor tool for discussion amongst many people. Overcome this by sending subscribers a short introduction or synopsis of your blog post. Then send them over to the blog to read and discuss. You could also mix it up. Invite people to visit your social media profile to share their thoughts about your email. Here’s a different approach from my inbox. A simple click to rate email that doesn’t involve taking up a lot of your subscribers’ time and yet lets them make their voice heard. Hopefully, videos are already part of your marketing toolbox. Make those videos work harder by sending your readers over to watch them. Videos let your subscribers experience you. They can see your face, and hear your voice. This reassures them they are connecting with a real person. Did someone pay you or your company a compliment? Maybe they wrote you asking a question, or left a mini review on your blog. Ask if you can share it. Then work those into your emails. This shows you are listening to what they are saying. It helps you create more content, helps others with the same concerns or questions. And finally, it is a form of social proof that you have happy customers. One of the easiest ways to create a bond with subscribers is on a webinar. Webinars give you a lot of time to present your message or show people your products. The live interaction allows people to ask questions and get the help they need quickly. It is as close to having an in-person group chat as you can get online and that is very helpful. Many people send discounts and special offers to their subscribers. The problem? They are also receiving the exact same discount offer from other people. This is very true in a large launch scenario where there are many affiliates pushing the same product. Do this instead. Skip the launch rush. Negotiate a special and truly exclusive deal with the product owner directly. It may not be the same deal. In fact, it shouldn’t be the same deal. It doesn’t even have to be a discount but maybe a meatier bundle offer. Anything that brings value to your subscribers and they can’t get it anywhere else. Your subscribers will appreciate it, and you will get better traction for affiliate offers. Today’s email tools allow you to really drill down, segment and tag your subscribers like never before. This allows you tailor your offers and messages as much or as little as you want. Take advantage of that. For example. Send an exclusive offer to those who clicked on a related link in the past. Some subscribers aren’t interested in a deep level of engagement and that’s OK. They still want to know their opinion matters. You could try a different approach like a survey. You get valuable feedback and they get to have their voice heard. Click to download this to work through on your own time. Now that you have gotten their attention with great subject lines, and developed a better rapport, subscribers are more likely to take action on your offers. That doesn’t mean you can just bombard them with any and every offer. And this is no time to get sloppy either. Here are some suggestions to get the best possible results. If you’ve been asking them to submit questions or running surveys as suggested above, you should already have a very good idea what your subscribers need and want. If you don’t, go back and do those first. Watch out for solutions to help them overcome those problems. Look out for tools and resources they are looking for in order to move forward. Whenever possible, ask for a special offer from the merchant themselves. Don’t try to mask the fact they might have to spend some money. People generally know things cost money. Let them know (briefly) there’s an offer inside or they may see some savings if they open. You don’t have to lay out all the details, but you should be direct. Make your email fairly short and to the point. Don’t bury it at the end of a full blown article. Subscribers won’t make it that far. Also, don’t try to add too many other offers and variables. A good general rule is to let one thought, one action, and one offer shine in the email. Most senders will broadcast one offer to everyone on the list. Sometimes that works. Other times it won’t. If you aren’t already segmenting, do so now. The sooner you do it, the faster you have the data to create and send offers based on what they need exactly and every person’s needs on your list is bound to differ to some degree. Launching a product? Let subscribers know something big is coming up. Start out by telling them to look out for a great offer in the coming days or weeks. As time draws near, you can slowly feed them more details about the launch. This keeps them interested and incentive to open every email leading up to the launch to learn more. An offer that is only available to a select few makes people feel special. It makes them feel like being part of your tribe has privileges no one else enjoys. Limit your offers to those to clicked the last few emails let’s say or those who bought a product. You could also send offers to only those who responded to your surveys. This is what Michael Hyatt did with a new product launch. First, he invited only subscribers to a closed group as part of a “think tank”. Members got to participate in the product creation process, see work products, influence design, have a say in the content. See an example of the email below. It also was a fantastic way to build anticipation as well. I was privileged ( <– see that? ) to be part of the group and was able to watch how all of this went down. When it came to launching time, many were so excited they didn’t have to be sold on the sales page. They were already pre-sold. Plus, the interaction and connection built inside the group is something nobody can steal from him, even if they don’t buy. He’s built a loyal following. Generally, you do not want to make your emails too wordy. But stories don’t have to be lengthy at all. Learn to craft short stories to draw readers in, then connect that to the offer. This helps break the cycle of constant hard hitting offers that tired out your list. Your sales pages are designed to tell the full story and convince visitors this product is the right one for them. Your email’s job is to get them to that page. Two different steps. There’s no need to sell people in the email. Just work on getting them to visit. The lack of follow-up is a most common mistake. While you don’t want to make them tired of hearing it, you should remind people of expiring offers. Don’t forget to follow up on buyers too. Thank them. Ask them for feedback. Let them know about features, settings, or information they might have missed in the product so they will consume it. Send them ideas, suggestions, and case studies if you have any so buyers can make full use of their purchase. Work (hard) on your subject lines. Test, and tweak them regularly. Keep things short and to the point. This applies to both subject line and the email copy itself. Given the above two points, it’s a good idea to learn more about good copywriting. As much as possible, reach out, invite, include. Make people feel special. Listen to their concerns. When you consistently work these things into your email process, you should start seeing better results. There’s a lot here to take in. If you can’t read it all in one sitting, bookmark this, OR you can download this entire process in eBook form and read it later. Download this whole process to enjoy and work through at your own pace. Here’s a terrific opportunity to educate your customers in a big way and at the same time show your expertise. Write an eBook on your specialty. This doesn’t have to be the size of a novel, it just has to be rich enough to cover what’s important for them to know. It gives you the opportunity to put any myths to bed as well. If a customer takes your eBook, you then have their undivided attention. They are actively seeking the information you are providing. Ebooks are great because not only are they typically a quick read, you also have the ability to put live links in place to bring in other resources for them to enjoy. Maybe send them to your website for more information. If you move into eBooks you are actively participating in content marketing. This type of marketing is hugely influential online right now. Content marketing is massively desirable to the search engines. Ebooks are fresh valuable content. You can use it in so many ways. If you’re trying to grow your list, you can use it as an email harvester. Offer it to customers who give up their email to possess it. You can use it to influence the way people view you. It shows your authenticity. I try at every turn to show customers what I know and how it can help them. Once you write one eBook, I can assure you, you’ll write more. There’s a large payoff, when people care about what you say. We all have an audience, most of us are unaware. Take the benefit of a doubt and try one small eBook. Email it to all your existing customers. I think you’ll be pleasantly surprised by the outcome. It will show your thought leadership. They will appreciate the education. Many I’m betting assume what you do or at the very least under estimate the full extent of your services. Consider an eBook for each service. Develop it into a series. If you also do public speaking having an eBook, to draw attention to, gives your listening audience a reason to visit your website. Direct them to a landing page where they can get your latest eBook for FREE. On the front end make it look like the cover of a book. The graphic and message should resonate with whom your speaking. If you get enough ebooks together over time, you could put them all together and do a hardcopy book. I call my book of tips – “101 Branding Tips.” I refer to it as my 114 page brochure. (http://www.edroachbrand.com/) it’s unconventional but is always well received. As content marketing suggests, it’s all about valuable information that customers are looking for. It all follows the mantra of give before you get. NEVER use this platform to sell directly. As you write your content, try your best to not write an ad. It’s tempting, but i suggest you resist the urge. Once you first experience the reaction to authoring content, it’s value will be apparent. Any time you approach the end of a calendar year it is a good time to spot if you have made any of the 4 Digital Marketing Mistakes. It is important to reflect and project your progress. In terms of reflecting, you should look at your business and consider everything that’s happened over the past year – good and bad. This will ultimately feed your ability to project. There will be things you want to bring to an end, as well as profitable aspects of your business that are worth continuing. 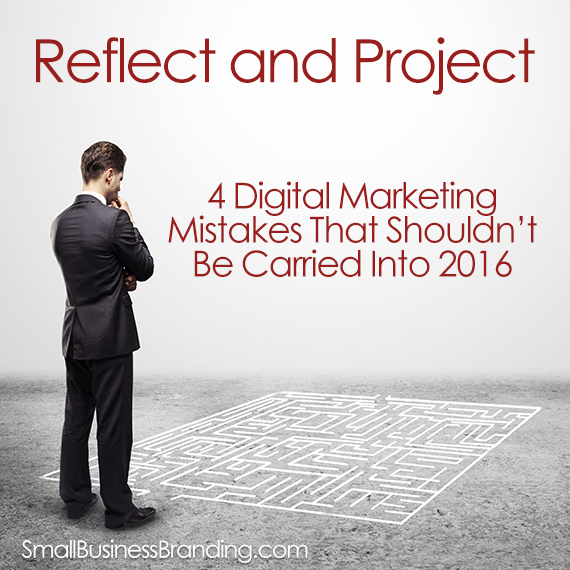 As a digital marketer, it’s imperative that you’re able to honestly reflect on the past year. There should be no sugar coating or overlooking different aspects of success or failure. If you want to improve upon this year and make 2016 your most successful year in recent history, then it’s time to identify and do away with the following 4 digital marketing mistakes that far too many brands made this year. Simply put, it’s amazing how many self-proclaimed digital marketers don’t actually understand the full definition of digital marketing. Unbeknownst to many, there’s a distinction between internet marketing and digital marketing. Internet marketing is a component of digital marketing, but these terms are not interchangeable. As successful entrepreneur Neil Patel says, “Digital marketing is any form of marketing products or services, which involves electronic devices.” While the growth of the IoT means most modern electronic devices are either directly or indirectly connected to the internet, this isn’t always true. Digital billboards, radio, and TV are all examples of digital marketing mediums that operate independently of the internet. Keep this in mind as you move into 2016 and don’t be afraid to broaden your horizons beyond your current internet tactics. There’s nothing wrong with sticking to internet marketing, but learn to use the correct term moving forward. In May of this year, it was announced for the first time ever that “more Google searches take place on mobile devices than on computers in 10 countries including the US and Japan.” We’ve seen this trend unfolding for years, but it’s now official. That means you can no longer ignore mobile in lieu of desktop. Mobile should be the priority in 2016. From web design and paid advertising to content marketing and social, optimizing for mobile is incredibly important moving forward. A handful of years ago, nobody could fault you for failing to track your digital marketing efforts. There simply weren’t very many tools and resources available to accurately monitor internet marketing campaigns in a cost-effective way. However, those days are long gone. In 2016, you’ll have access to hundreds of different budget-friendly tools that can help you achieve clarity and visibility in real-time. From predictive analytics tools to social listening resources, there’s a technology for every need. For someone who’s never invested in video, the process can seem intimidating and expensive. However, now’s the time to jump on board. Just scroll through your Facebook newsfeed or head over to YouTube and you’ll see just how prominent video is in today’s internet marketing mix. Currently, online video accounts for 50 percent of all mobile traffic. That number is expected to grow in the coming months. By 2017, 69 percent of all consumer internet traffic will be video. While you shouldn’t invest in an all-video strategy, it needs to play a role in your digital marketing efforts moving forward. As you can see, there’s much room for improvement in the digital marketing industry. While you may not be making all of these mistakes, you’re probably making at least one. By eliminating these faults and correcting them before your enter the new year, you can enhance your efforts and incite growth. In the world of promotion, branding has been called anything from a logo, to putting a logo on things, to a general image. If I may be so humble to speak for those those of us who specialize in branding, a brand could replace the word “reputation.” How a customer perceives you, your town , your product, experience, or organization etc. is your brand. 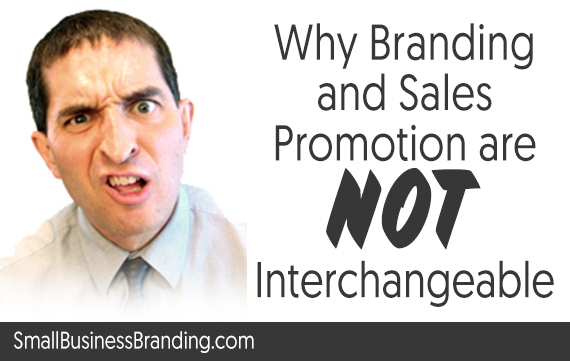 Most marketing people I come into contact with simply don’t get it and arrogantly think that sales promotion is 100% of what branding encompasses. Now, granted the end game in branding is to bring more dollars into the organization, BUT that isn’t soley achieved through sales promotion. Branding done properly with a skilled facilitator looks at all aspects of your brand to see that all elements are pulling in the same direction. All of this is strategic thinking and much of it exists outside the sales and promotion circles. HR plays a role, business management culture plays a role, even people associated with the organization such as the custodian can affect the brand for good or bad. My opinion here on this blog post affects my brand, depending on my audience’s response to it. Once you learn to embrace your brand and define it, only then will you appreciate the value it holds in making your entire business a success on multiple levels including but not limited to sales promotion. Get Real! Brand Authenticity and You. Today’s marketplace is a great place for brands and their advocates to exist. Traditionally, prior to the web, all a brand could do was to make their consumers “aware” of their brand was using advertising channels such as bill boards, transit, radio, TV and public relations. Once a consumer got wind of the brand that interested them, they would have to physically visit the bricks and mortar location for more information. Or they could look in their mail boxes for flyers, or their daily newspapers for inserts and printed ads etc. The entire buying cycle was initiated by the brand and reacted to by the buyer. Very straight forward and not very deep. In today’s marketplace the consumer has a limitless access to the brand’s environment. Brand’s can more easily form strong relationships with their customers. Some would say today’s digital environment makes loyalty tougher. I believe it to be easier, so long as you’re willing to engage customers with a genuine brand experience. If the brand chooses to try and manipulate the experience based on an unrealistic expectation, they will more likely be viewed as not being authentic. 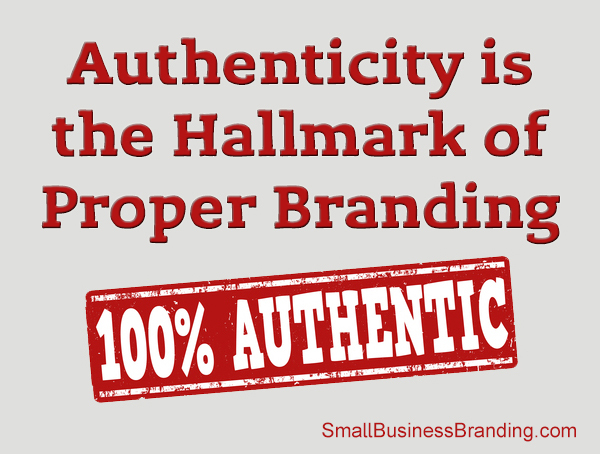 That authenticity is a hallmark of proper branding. But if your brand strives to provide an authentic persona, it’s a great platform to engage customers. You’re able to feed them your expertise on many levels. This acceptance allows you the potential to charge more for your services. If you’re a services based brand this open environment allows you to properly exhibit your expertise and this draws customers to you. Your are perceived as the expert your brand touts you to be. The bottom line is to embrace the opportunities the digital world is serving up. You make think that there’s no space for you to play or that it’s over your head. Toss those barriers aside and embrace the web. You will be shocked with the results of your efforts over time. Subscribe to download this guide for FREE and work through the steps at your own pace. Discover how to start your own podcast business, leverage it to grow an existing business, grow your influence, and more. Have Your Own Store By This Weekend. Get This Quick-Start Guide To Launch Your Own Profitable Store Online. Launch Your Own Service Business By This Weekend. 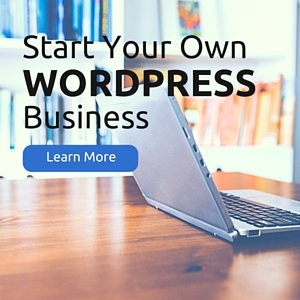 Get This Quick-Start Guide To Starting A Service Business Online.